I think I have a problem. I can't stop buying sweaters. Lately, a sweater skinny jeans and boots are all I want to wear. I love this sweater (I know I say that a lot lol) but I do. I am wearing a small for reference. I went up a size so it was a little looser on me. It comes in 4 colors. I really want it in another color. I wore this outfit to run errands yesterday. And since I do live in Florida I thought I was going to get some weird looks. But I was not the only one wearing Fall clothes. And a couple of people stopped me and told me they liked my outfit. I was surprised! I thought they were going to say I was crazy. But since I have always been very into fashion I have always dressed this way this time of year. I get so sick of Summer clothes. So if I didn't I would never really get to wear different clothes. Don't forget about the Shopbop friends and family sale that is going on. Get 25% off your entire purchase with code INTHEFAM25. I got these jeans. I also linked a fewmore of my favorites below. There are so many great things included. Gorgeous! And that sweater paired with those boots... Love! Love the high-low back of that sweater! Also I think I need a pair of Rag & Bone jeans, love these! Oh I love this outfit looks so great for fall. 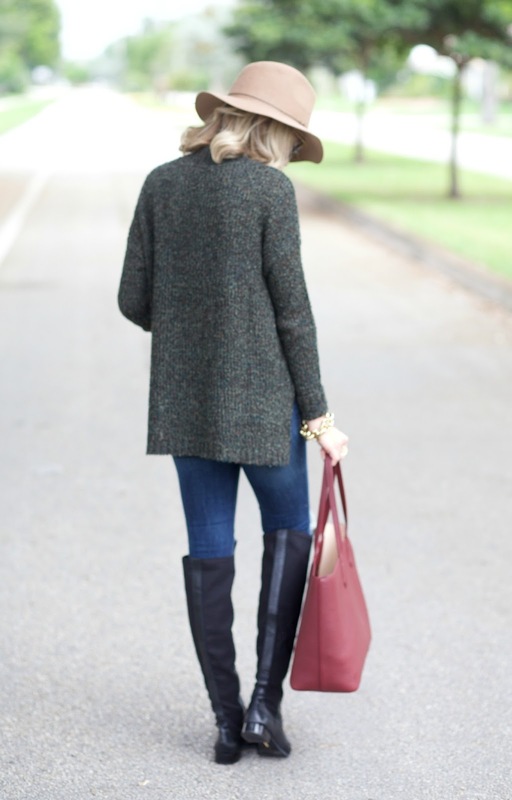 I love this quintessential fall outfit!